What Are the Best Online Doctorate in Curriculum and Instruction Programs? What Else Can I Expect From an Online Doctorate in Curriculum and Instruction Program? An online doctorate in curriculum and instruction prepares students to work in early education settings, middle and high schools, and universities. Participants of these programs learn how to design and implement curricula that serves both students and teachers. The best online doctorate in curriculum and instruction programs combine coursework and field education. A typical program covers the fundamentals of curriculum design, ethics, law, and psychology to produce well-rounded graduates who can use education to guide future leaders. Additionally, the Bureau of Labor Statistics projects an 11% increase in the number of instructional coordinators between 2016 and 2026 -- significantly higher than the average job in the nation. Many schools require candidates to hold undergraduate and master's degrees to gain admission into an online doctorate program in curriculum and instruction. Candidates may also need to hold a valid teaching or administrative license, which may impose an additional set of requirements. An academic adviser or enrollment counselor can confirm whether or not a potential online program requires prior work experience. Applicants should conduct ample research to find the best online doctorate in curriculum and instruction program that matches their academic and career goals. Students can explore a school's website to learn more about doctorate programs and course offerings. Calling a school's admissions offices to speak with an enrollment counselor or academic adviser can also be helpful; these individuals can provide specific details about a program and help students contact department staff. CAN I WORK WHILE I COMPLETE MY ONLINE DOCTORATE IN CURRICULUM AND INSTRUCTION? Programs that award a doctoral degree in instruction online typically cater to students looking for a flexible academic schedule. Additionally, these programs generally require fieldwork, meaning most doctorate students must work while earning their degrees. Learners typically coordinate their residencies with their instructors. Aspiring graduate students can talk with an enrollment counselor to learn more about the residency application process. WHAT ARE THE ADVANTAGES TO EARNING MY DOCTORATE IN CURRICULUM AND INSTRUCTION ONLINE? Students often choose online learning to take advantage of more flexible scheduling. By accessing their coursework online, distance learners can more easily incorporate their education into their everyday lives, without spending the time it takes to physically attend class. Additionally, the best online doctorate in curriculum and instruction programs cost less than their on-campus counterparts. Program websites list tuition and fee rates to help with comparison shopping. Andrews' research-intensive Ph.D. in curriculum and instruction online requires at least 61 credit hours to complete, but some learners gain more credits with their dissertations. Andrews also offers an online doctor of education program, which focuses less on research and philosophy than the Ph.D. plan. The Ed.D. courses consider the practical applications of education research and prepare candidates to work in school administration. Both doctoral programs give learners the flexibility to build a plan that suits their schedules. Doctoral candidates can complete their studies entirely online or take some evening courses on campus in Berrien Springs, Michigan. Students take mostly asynchronous courses that allow them to complete work at their own pace. However, Andrews offers some synchronous courses for candidates who learn better through live discussions. Both programs hold certification from the National Council for Accreditation of Teacher Education, one of the premiere accrediting bodies for education studies. Andrews partners with school districts, universities, and teachers' organizations to design courses that give students the skills they need to serve the community. Andrews requires Ph.D. and Ed.D. applicants to hold master's degrees from accredited universities with minimum 3.3 GPAs. Candidates must also submit three letters of recommendation from academic advisers, education professionals, or work supervisors; essays; GRE scores; and resumes. Carson-Newman offers an online doctorate in education in curriculum and instruction leadership with a Christian focus. The 57-credit curriculum includes four sections: core, concentration, research, and dissertation. The core leadership section comprises 12 hours with classes such as ethical, social, and spiritual leadership principles. Students complete 24 hours in the concentration, nine credits of research classes, and 12 dissertation credits. Carson-Newman allows learners to complete one course at a time and graduate in about three years. During the spring and fall, each term runs eight weeks. In the summer, candidates complete up to four classes. Learners can take up to seven years to complete the curriculum. Carson-Newman offers affordable tuition and a pay-as-you-go plan, which allows students to make monthly payments. Applicants need an accredited master's degree and must submit official transcripts, statements of purpose, and scholarly writing samples. Carson-Newman expects applicants to submit GRE results with minimum 290 cumulative scores on the verbal and quantitative sections. Candidates must also earn 4.0 or above on the writing portion of the exam. Although the university does not require applicants to hold professional teaching licenses, those with teaching credentials should submit copies of their license to the admissions office. Columbus State's doctor of education program concentrates on curriculum and leadership rather than instruction. The 63-credit program teaches doctoral candidates to improve learning through accountability, research, and useful curriculum models. Because the program falls under the school of education and health professions, students learn to devise research models with the same rigor as those who study medicine. Graduates find work as school principals, district curriculum leaders, superintendents, and curriculum specialists. The focus on research also allows candidates to remain in academia. Students complete the program through a cohort model and hybrid classes. To earn the degree, learners need a minimum 3.25 GPA with no more than one "C" throughout their time in the doctoral program. Students must also write and defend a dissertation. The Georgia Professional Standards Commission and the National Council for Accreditation of Teacher Education accredit the program. Applicants need an accredited master's degree with a minimum 3.5 GPA. Candidates must submit GRE scores from the past five years with at least a 297 combined score on the quantitative and verbal sections and a 3.5 or higher on the written portion. Columbus State requires applicants to hold at least four years of professional experience, either in schools or leadership roles within the private sector. The university runs background checks on candidates. Concordia in Chicago was established in 1864 as a teaching school. The private, nonprofit school based its instruction on the Lutheran tradition with Christian values and continues to uphold those ideals today. Students at the school enjoy student-to-faculty ratios of 11-to-1. The university holds regional accreditation from the Higher Learning Commission. Concordia offers two online doctoral programs in curriculum and instruction. One leads to an Ed.D. while the other results in a Ph.D. degree. The curricula include many of the same classes, including some in research, curriculum design, and multicultural education. Learners on both tracks complete dissertations and take comprehensive exams at the end of the program. The Ed.D. consists of 61 credits, including a course in philosophical and theoretical foundations of leadership. The Ph.D. requires 67 credits. The additional hours come from research courses. Students complete their courses online, on campus, or through a combination that suits their needs. Concordia requires doctoral applicants to hold master's degrees from accredited institutions with minimum 3.0 GPAs. Candidates must submit MAT or GRE results, two letters of recommendation, and essays explaining their interest in the program. Applicants must also demonstrate work experience that includes at least two years of teaching or administrative work. Evangel's doctor of education program in educational leadership, curriculum, and instruction online requires learners to complete 50 credits. The school offers most courses in online and on-campus formats. However, distance learners must come to the Springfield, Missouri campus twice during the three-year program for summer residencies. The curriculum includes courses on topics such as resource management, ethics for school leaders, and contemporary issues in curriculum and instruction. Evangel bases each course on Christian values. This accredited online doctoral program in curriculum and instruction prepares graduates to work as curriculum specialists, teacher leaders, superintendents, and assessment officers. Evangel offers the benefits of private education with below-average tuition prices. Learners pay the same tuition rates regardless of residency. The school offers a flexible tuition payment plan. Prospective learners can use the school's net price calculator to plan their finances. Applicants need an accredited master's degree with a minimum 3.0 GPA. Candidates must submit results from any standardized graduate entrance exam, including the GRE, MAT, or GMAT. The school does not publish minimum score requirements for these tests. The Higher Learning Commission grants Evangel regional accreditation. Georgia Southern provides an online doctorate in education curriculum and instruction with a unique focus on the history of American education and power in schooling. Learners choose one of four specializations: cultural curriculum studies, instructional improvement, multicultural/international studies, and teacher leadership. Core classes teach learners about theoretical, historical, and ethical considerations of curriculum design. Degree candidates complete 12 hours of concentration and dissertation credits. Students must successfully defend their dissertations and earn a minimum 3.25 GPA on all coursework to qualify for graduation. Learners cannot earn a "C" in more than one class. Georgia Southern requires doctoral applicants to complete academic writing samples based on one of five articles that the university provides. This process helps the admissions board evaluate the candidate's research and writing abilities. Although the school does not require entrance exams, students may submit MAT or GRE results to bolster their application. Applicants must submit transcripts and complete interviews with faculty. The school holds regional accreditation from the Southern Association of Colleges and Schools Commission on Colleges. The School of Education holds programmatic accreditation from the National Council for Accreditation of Teacher Education and the Georgia Professional Standards Commission. The Ph.D. in curriculum and instruction online at Johns Hopkins follows a cohort model. The renowned private school accepts new cohorts each fall. The degree plan follows an apprenticeship model. Students gain credit through one-on-one mentorship and research participation. This method allows doctoral candidates to learn in intensive environments from some of the country's leaders in curriculum and instruction. Learners also take a few traditionally structured classes with lectures and exams. Johns Hopkins offers these courses through world-class facilities, such as the school's Center for Research and Reform in Education. This acclaimed center advocates for whole-school reform, conducts groundbreaking research, and manages a library of educational studies. Each cohort consists of 4-8 students who receive full-ride scholarships to the program. These learners gain living stipends so that they can focus on their studies rather than work. Johns Hopkins requires all candidates to study full time. Students should expect to spend at least four years in the program, although some dissertations take longer. Johns Hopkins requires applicants to hold an accredited master's degree in education or a related area. Candidates submit GRE scores, current resumes, three letters of recommendation, writing samples, and letters of intent. Although the school does not post a minimum GPA or GRE score, candidates should note that admissions to Johns Hopkins remains competitive. Keiser offers a Ph.D. in educational leadership that requires 60 credit hours. Although the diploma does not specify curriculum and instruction, students take courses on these topics. Other courses include policy, politics, and community relations; distance education management; and innovation technology leadership. This broad curriculum qualifies graduates for diverse jobs. While many graduates work in schools and districts, the program also prepares professionals to work in the private sector as training managers. Additionally, the courses in technology and distance education offer insights into the future of education, preparing graduates for positions in education innovation. Doctoral candidates choose between online classes and on-campus classes in Fort Lauderdale. The university offers on-campus courses in the evenings to accommodate working professionals. The private school boasts small class sizes and regional accreditation from the Southern Association of Colleges and Schools. Keiser's admissions board evaluates applicants based on their full history, so the school does not post minimums for entrance exam scores or GPAs. However, all applicants must submit transcripts that prove they hold master's degrees from accredited universities. Applicants also submit GRE or MAT scores, two letters of recommendation, and current resumes. Learners with GPAs above 3.2 or with GPAs of 3.0 and two years of experience waive the entrance exam requirement. Transfer students can transfer a maximum of six credits to the program. Liberty's online doctorate in education curriculum and instruction consists of at least 60 course credits on topics such as theories of educational leadership, advanced educational statistics, and conflict resolution. Students must pass a comprehensive exam and complete a dissertation, which comprises 12 credits. Students who take two courses at a time can complete the curriculum in nine semesters. Degree candidates can add field experiences to bolster their resumes. Because the program does not lead to teaching licensure, students seeking this credential must add field experiences. Students can earn advanced licenses in areas like school counseling, reading specialist, math specialist, and school administration. Students need a minmum 3.0 GPA and a B- or better on all classes to qualify for graduation. Although students complete the core curriculum entirely online, learners sometimes attend one-week intensives on the Lynchburg, Virginia campus. Liberty offers intensives near school breaks, such as during spring break or the summer. The university allows doctoral students to transfer up to 15 credits from accredited universities as long as those credits come from postgraduate courses and cover the same material as Liberty's curriculum. Jerry Falwell founded the private, nonprofit university in 1971 with evangelical Christian values. The National Council for Accreditation of Teacher Education accredits the doctoral education program. NMSU offers an Ed.D. and a Ph.D. in curriculum and instruction online. Both plans require at least 66 credits, and some learners take more. Learners on both tracks choose emphasis areas, such as bilingual education, learning design and technology, or early childhood education. Both programs require candidates to complete dissertations. Prospective students need three years of teaching experience to apply to either program. This experience can come from K-12 or postsecondary levels. Applicants must also hold accredited master's degrees in education. NMSU accepts applications for the online cohort during even-numbered years; candidates must submit full portfolios by December 15 of those years. Admitted students attend a doctoral orientation on campus. For the first semester, students regularly meet with advisers online or in person. NMSU provides top-quality, research-focused, and public education at an affordable price. New Mexico residents pay substantially less than their out-of-state classmates. The school boasts diverse students from 49 states and nearly 90 countries. The Higher Learning Commission grants NMSU regional accreditation. Regent's online doctorate in education curriculum and instruction boasts more than 825 teacher-of-the-year award recipients. The university offers a Christian-focused program that leads to an Ed.D. degree. The 66-credit curriculum includes courses in diversity, inclusion, and theory in the classroom; qualitative data analysis; grant writing for leadership-minded educators; and Christian worldview for educators. Although students complete the majority of classwork online, Regent requires Ed.D. candidates to attend two, week-long residencies during the program. Students stay near the campus in Virginia Beach and attend classes Monday through Thursday. Regent schedules the residencies during the summer to fit the needs of working educators. Students who hold Ed.S. diplomas before applying may earn advanced status admissions as part of a cohort. This separate plan allows learners to complete the program quickly. Ed.D. candidates pay the same tuition regardless of residency. Applicants submit unofficial transcripts and a questionnaire. Regent then schedules interviews with candidates, which can take place online or in person and last about one hour. Learners who pass these steps must then submit official transcripts. The school hosts frequent online admissions information sessions to help prospective students navigate the process. The school earns regional accreditation from the Southern Association of Colleges and Schools Commission on Colleges. Southeastern University is a private, Christian liberal arts university located in Lakeland, Florida, and remains the largest Assemblies of God-affiliated educational institution in the United States. Southeastern University offers a doctorate in education ideal for aspiring instructional designers and other education administrators. This doctorate allows students to choose from two concentrations: curriculum and instruction or organizational leadership. Southeastern University's doctorate in education requires 54 credit hours of coursework and culminates with a dissertation. The curriculum generally takes 42-45 months to complete. Core courses include learning and cognition, program evaluation, principles of ethics and leadership, and public policy. The curriculum and instruction concentration covers curriculum theory and design, development of technology-mediated delivery, and advanced quantitative research. The organizational leadership concentration covers organizational change and strategies, organizational systems and management, and education policy. This degree prepares students for leadership positions in education, such as school superintendent, principal, curriculum specialist, nonprofit leader, and business consultant. Applicants should hold a graduate degree from a regionally accredited institution with a minimum 3.0 GPA and at least three full-time years of work experience in a related field. SEU accepts credit transfers up to the master's level from regionally accredited institutions and institutions accredited by the Association for Biblical Higher Education (ABHE). Southeastern University is accredited by the Southern Association of Colleges and Schools Commission on Colleges (SACSCOC). Founded in 1906, Southern Wesleyan University is a private, Christian college located in Central, South Carolina. SWU's doctorate in education curriculum and assessment prepares students for leadership positions in nonprofit organizations, technical colleges, four-year universities, and K-12 institutions. It provides students with the theoretical concepts and best practices for instructional strategies, program evaluation, and student assessment. This degree requires 54 credit hours of coursework and takes an average of 36 months to complete. Courses take place in an online format in seven-week sessions, with start dates in the fall and spring. While most of the program can be completed online, students must attend a one-week summer residency course during three summers on campus. SWU also offers the option of summer intensives. The curriculum includes courses in data driven instruction, curriculum design, curriculum assessment for diverse learners, research and analysis, and program evaluation. All the knowledge and skills students learn throughout the program culminate in the completion of an original research project and dissertation. SWU's doctorate in education prepares students for careers as K-12 educators, nonprofit/ministry leaders, government services leaders, or college faculty or staff. Admission requirements include a master's degree in education from a regionally or nationally accredited institution with at least a 3.0 GPA and a minimum MAT score of 350 (or GRE equivalent). SWU is accredited by the Southern Association of Colleges and Schools Commission on Colleges (SACSCOC). Texas A&M is a public research university located in College Station, Texas, and is one of the state's flagship institutions. Texas A&M offers an online doctorate in education curriculum and instruction ideal for aspiring leaders in education contexts, including K-12 institutions, colleges and universities, and related positions in government and nonprofit agencies. As opposed to a Ph.D., this Ed.D. program comprises a professional degree designed to develop knowledgeable and scholarly practitioners dedicated to using evidence-based strategies in education. Texas A&M's doctorate in education requires 64 credit hours of coursework beyond a master's and takes roughly four years to complete. Courses are delivered asynchronously, and the program utilizes a cohort model where students entering the program enroll in classes together until degree completion. The curriculum includes professional development strategies for teachers, urban schools and communities, program evaluation, problem-based research frameworks, and curriculum theory. In addition to coursework, the degree requires all students to complete 150 hours of hands-on work experience in an internship conducted under the supervision of their committee chairs. The program culminates in a record of study, a publishable piece of work synthesizing the knowledge and skills gained throughout the doctorate program. Admissions requirements include at least five years of teaching experience, a master's degree from an accredited institution with a minimum 3.3 GPA, and GRE scores. Texas A&M is accredited by the Southern Association of Colleges and Schools Commission on Colleges (SACSCOC). The University of West Florida is a public university located in Pensacola, Florida that offers a specialist of education program in curriculum and instruction ideal for aspiring leaders in education responsible for curriculum-related decision making and problem solving. In this graduate certificate program, students can choose one of the following concentration areas: instructional design and technology, administration and leadership studies, or curriculum and instruction. UWF's specialist of education program (Ed.S.) requires 36 hours of coursework beyond the master's, including 18 hours of core courses, 15 hours in a chosen focus area, and a capstone project. Core courses include psychological foundations of education, philosophical foundations of education, educational statistics, qualitative methods, and the analysis of curriculum and instruction. The instructional design and technology concentration offers a selection of courses on instructional design theory, human performance improvement, and human performance technology interventions. Courses offered under the administration and leadership studies concentration include public budgeting, strategic management, and public service ethics. The curriculum and instruction concentration provides students with courses on assessment literacy, learning theories and current teaching practices, and curriculum evaluation. Courses take place in eight-week sessions, and students can choose to begin classes in the fall, spring, or summer. Core courses can transfer toward the UWF doctorate in education program if the student decides to pursue the Ed.D. rather than the Ed.S. Admissions requirements include a master's degree from a regionally accredited institution with a minimum 3.25 GPA and submitting GRE, MAT, or GMAT scores. The University of West Florida is accredited by the Southern Association of Colleges and Schools Commission on Colleges (SACSCOC). The University of Arkansas is a public research university located in Fayetteville, Arkansas. U of A offers a doctorate in education program in educational leadership that prepares students for careers as school administrators, superintendents, principals, government agency officials, and other positions related to educational decision making. U of A's doctorate in educational leadership requires 96 credit hours of coursework, which includes up to 60 credit hours from master's or specialist degrees, and 18 dissertation hours. Core courses include problems of practice, educational policy and change, introduction to qualitative research, statistical literacy, and program evaluation. Students must maintain a 3.25 GPA throughout the program to graduate. While classes occur entirely online, students must attend three intensive weekend seminars on campus. The program takes place in a cohort-structure, and the on-campus intensives serve as an opportunity for students to meet fellow educators in their cohorts, network, and liaise with faculty. The degree culminates with a dissertation based on an original research project developed by the student in conjunction with his or her committee members. Applicants must hold a master's degree and an education specialist (Ed.S.) degree or district-level certification and a valid teaching license. If students are admitted without a specialist degree, they must take courses in the specialist program. Applicants also need to submit GRE test scores. U of A is regionally accredited by the Higher Learning Commission (HLC). The University of Louisiana at Monroe is a public university that offers a Ph.D. in curriculum and instruction online program, preparing students for careers as instructional coordinators, instructional designers, education administrators, superintendents and principals, or university professors. The program provides students with comprehensive knowledge of educational theories, evidence-based practices, and qualitative and quantitative research methods useful in curriculum assessment and evaluation. ULM's doctorate of education program requires 60 credit hours of coursework and can be completed in two years. Courses last eight weeks and students can choose from four start dates throughout the year. Core course topics include educational research, applied statistical analysis, instructional design and technology integration, quantitative and qualitative methods in educational research, and education for diverse students in a global society. The program includes additional courses in curriculum theory and design; instructional decision making; strategies for school improvement; and educational law, policy, and ethics. Students also must complete a dissertation based on an original research project conducted under the guidance of their doctoral committee. To gain admission to the program, applicants should hold a master's degree in any discipline with at least a 3.25 GPA and a minimum GRE score of 292 or MAT score of 397. ULM is regionally accredited by the Southern Association of Colleges and Schools Commission on Colleges (SACSCOC). The University of Memphis is a public research university located in Memphis, Tennessee, that offers an online doctorate in education instruction and curriculum leadership with an emphasis in instructional design and technology. This program prepares students to become scholars and researchers capable of working as instructional designers, university professors, directors of curriculum and instruction, directors of educational technology, and other related positions. UofM's Ed.D. program requires 54 credit hours of coursework and the completion of a dissertation. It generally takes 3-4 years to finish curriculum requirements and graduate. This program offers two prerequisite courses in instructional design process that must be completed before or during the first year of study. This prerequisite does not count toward the 54-credit-hour requirement. Core courses include theories and models of instructional design, developing interactive learning environments, qualitative research in education, and evaluation and synthesis of instructional design technology research. This cohort-based program allows students to take virtual courses with a consistent group of peers throughout the degree. Courses take place in seven- or 14-week sessions. This schedule allows students to work on 2-3 courses simultaneously during any given semester. To gain admission to UofM's Ed.D. program, applicants should hold a master's degree from an accredited college or university. UofM is regionally accredited by the Southern Association of Colleges and Schools Commission on Colleges (SACSCOC). The University of South Carolina is a public research university located in downtown Columbia, with seven other satellite campuses across the state. UofSC offers a Ph.D. curriculum and instruction online program with a choice of two concentrations: curriculum studies or education technology. This program benefits students aspiring to become curriculum specialists or education technology directors at K-12 schools, higher education institutions, or in the private sector. UofSC's doctorate in education program requires 60 credit hours of coursework and generally takes 36 months to complete. Students enroll in 12 hours of core courses before beginning specialized courses in their chosen concentration. Core courses include diversity and the curriculum, applications of learning principles, and instructional design and assessment. Courses in the curriculum studies concentration cover racial and ethnic diversity and the curriculum, gender diversity in schools and communities, principles of curriculum instruction, and principles of action research with courses in the education technology concentration include technology application for diverse populations, design and evaluation of information access and delivery, evaluation of education technology, and design and development tools. The program culminates with a dissertation. Admission requirements include holding a master's degree from an accredited institution and submitting either GRE or MAT test scores. Certified teachers in South Carolina qualify for reduced tuition costs. UofSC is accredited by the Southern Association of Colleges and Schools Commission on Colleges (SACSCOC). The University of Toledo is a public research university located in Toledo, Ohio, that offers a Ph.D. curriculum and instruction online program with a concentration in special education. This degree benefits special education teachers and professionals who wish to work in research or leadership positions at K-12 institutions, universities and colleges, nonprofit organizations, or government agencies to improve the quality and structure of special education programs. UT's online doctorate in education curriculum and instruction requires 70 hours of coursework and can be completed in 4-5 years. The degree culminates with a dissertation where students demonstrate knowledge and their ability to conduct an original research project regarding learners with disabilities and how to support them through curriculum design and delivery. The curriculum consists of nine hours of professional seminars in core topics, 12 hours of coursework in research methodology, 30 hours of coursework in the area of concentration, and nine hours of dissertation work. Concentration-specific courses focus on advanced theories and practices in special education and early intervention. Students also learn to employ research tools like qualitative and quantitative methods, single case design, or survey research to investigate how to meet the needs of learners with disabilities and support their families. For admission, applicants must hold a master's degree from an accredited four-year university with a minimum 3.0 GPA. UT is accredited by the Higher Learning Commission (HLC). The University of West Georgia is a public university located in Carrollton, Georgia, that offers a doctorate in education in school improvement program for educational leaders and scholars aspiring to create sustainable change and improvement at K-12 institutions. Many graduates enter the field as superintendents, principals, instructional supervisors, curriculum coordinators, and department or grade-level chairs. UWG's doctorate in education program requires 45 hours of coursework and can generally be completed in 3-4 years. Core courses fall under three broad topics: teaching and learning, leadership for school improvement, and research methodology. The program offers a variety of different concentrations within the broad spectrum of school improvement, including school counseling, educational leadership, online teaching, instructional technology, reading, media specialist, teaching English to speakers of other languages (ESOL), special education, and early childhood education. Students receive the option to curate their own specialized area of concentration with program director approval. Coursework occurs in an asynchronous format where students can listen to lectures and access course materials at their own pace as long as they meet assignment and exam deadlines. To gain admission, students need a master's degree from an accredited university and must score a minimum of 151 in verbal reasoning, 145 in quantitative reasoning, and a 4.0 in writing on the GRE. UWG is accredited by the Southern Association of Colleges and Schools Commission on Colleges (SACSCOC). The University of Wisconsin-Stevens Point is a public university that offers a doctorate in education in educational sustainability ideal for professionals interested in fostering socially, ecologically, and economically sustainable communities through the development of improvements in systems of teaching and learning. Under the broad umbrella of sustainability, this program promotes transformative learning, systems thinking, ecological thought, pluralistic democracy, diversity and social justice, and ethical action. UWSP's Ed.D. program requires 54 hours of coursework and can be completed in three years. This cohort-based program encourages community-based practice and fosters professional relationships between students. While all of the coursework occurs online, the program requires students to attend a four-day, in-residence session each summer, which serves as an orientation during the first year and a symposium the following years. Due to the cohort structure, this program only offers start dates once a year in the summer, beginning with the in-residence orientation. The curriculum offers a broad selection of courses, including theoretical foundations of sustainability leadership, social justice in education for sustainability, reorienting curriculum and programs towards a sustainable future, global environmental change, ecological foundations, research methods, and teaching and learning in alternative educational settings. The degree culminates with a dissertation as a capstone experience. Admissions requirements include holding a master's degree from a regionally accredited university and professional experience related to educational sustainability. GRE scores are not required. UWSP is accredited by the Higher Learning Commission (HLC). The University of Florida is a flagship public research university located in Gainesville that offers a variety of online degrees and programs. Their online doctorate in education curriculum and instruction degree with a specialization in teachers, schools, and society benefits educators who wish to integrate theory and research into their instruction and help them confront education challenges. UF's online Ed.D. requires 90 credit hours of coursework beyond the bachelor's degree and can typically be completed in four years. Courses cover professional development and teacher learning, education and American culture, critical pedagogy, teacher learning and socialization in poverty schools, issues in school reform, foundations of research in curriculum and instruction, and practitioner research. This cohort-based program allows students to take classes with the same group of peers throughout the degree. Course sessions occur in eight- or 16-week sessions, and students must attend a week-long, on-campus intensive every summer for the first three years. The degree culminates with a dissertation where students demonstrate their ability to leverage research to inform their practice as educators. To gain admission into the program, students should hold a master's or specialist degree in education, three years of practical experience in education, a minimum 3.0 GPA in previous undergraduate and graduate work, acceptable GRE test scores, and be currently working as an educator. UF-Online is accredited by the Southern Association of Colleges and Schools Commission on Colleges (SACSCOC). Online doctorate in curriculum and instruction programs consist of coursework, residencies, and dissertations. However, credit requirements and course offerings vary depending on the institution. Regardless, students should have knowledge of the educational system and some administrative experience prior to entering a program. At minimum, online doctorate in education curriculum and instruction programs require applicants to hold a bachelor's degree. Many programs impose additional requirements, such as a master's degree in education or experience working as a teacher or administrator. Programs requiring work experience also tend to ask for at least one recommendation letter from a work supervisor. Some schools may accept promising applicants who lack these experience or education requirements as long as students take foundational coursework during the first 1-2 years of their program. Online doctoral programs in curriculum and instruction -- like their on-campus counterparts -- aim to attract the best applicants. As such, many schools use GPA cutoffs; the best programs require a minimum GPA of 3.0-3.5. However, these programs may make exceptions in specific circumstances. Finally, like many other graduate programs, applicants often need to submit GRE scores. Programs may waive this requirement for applicants who already hold a graduate-level degree. Specific class offerings vary by program. However, the core curricula of online curriculum and instruction programs typically have some classes in common, including the ones mentioned below. Introduction to Diversity and Curriculum: This course focuses on curriculum and instruction, tackling issues affecting learners in different age groups. Students learn to recognize and understand developmental differences among child, teenage, and adult learners, exploring how the right curricula can take advantage of these differences and improve learning outcomes. Gender Diversity in Schools and Communities: This course explores the historical, psychological, and sociological contexts of gender relations. Students analyze different cultures and the politics surrounding gender as it relates to school systems. They also explore feminist theory and its impact on education. Curriculum Leadership: In this course, which focuses on transformational leadership and its role in education, degree candidates learn the tools needed to develop appropriate curricula to meet students’ needs. Additionally, participants learn the importance of fostering diversity and supporting social justice within the educational system. HOW LONG DOES IT TAKE TO GET AN ONLINE DOCTORATE IN CURRICULUM AND INSTRUCTION? Credit requirements and fieldwork can affect the length of an online doctorate in curriculum and instruction program. Each school imposes its own program requirements, including a mandated number of credits. Some programs may also require students to complete specialty courses unique to that institution. Doctoral programs typically require anywhere from 60-90 credits and take 3-5 years to complete. Schools may deliver online programs in asynchronous and/or synchronous formats. Learners taking asynchronous courses study and complete coursework at their own pace, typically meeting weekly deadlines set by faculty members. Synchronous programs may use a hybrid format -- mixing online and in-class coursework -- or adopt a cohort format. In cohorts, students progress through classes in lock-step with a group of their peers. Participants may meet in-person and work on assignments together, although some courses allow students to complete group work entirely online. Online doctoral programs in education curriculum and instruction convey many essential skills and competencies. This section describes five core skills students typically hone during the course of their programs. Curriculum: Education leaders must understand both modern curriculum -- including its development, forms, and foundations -- and how changes in education might affect curriculum development for future teachers. This skill prepares graduates to work with educators at all levels. Research: To write papers and complete their dissertations, students must learn advanced research skills, including citation styles and research methodologies. On the job, graduates use these skills to find the latest publications, which can help improve the performance of the people they supervise. Leadership: Graduates seeking to become education administrators should possess strong leadership skills, including the ability to provide feedback, mentor others, and manage a workplace environment. Students gain these skills by studying successful leaders' strategies and techniques. Analysis: In addition to strong research and leadership skills, curriculum and instruction leaders need to know how to analyze data related to numerous topics. Gaining this skill requires studying statistics and other analytical methods. Instruction: All educators -- no matter their job titles or responsibilities -- should understand modern instructional methods. Learning about current instructional methods helps graduates mentor teachers and other professionals about instructional best practices. Online doctoral programs in curriculum and instruction include extra requirements that students must complete in addition to their coursework. In some programs, students intern at local schools or district offices for one semester during, typically during their second year of study. Many programs also require a capstone or action research component, where students perform original research. Students use these research results to write their dissertations, which may take 1-2 years to complete. To earn their doctorate, students must also successfully defend their dissertation to their defense committee. The Council for Higher Education Accreditation (CHEA) and the U.S. Department of Education oversee a host of accrediting agencies, certifying that these organizations use reasonable standards when reviewing institutions and verifying their accreditation status. The most popular and widely respected form of accreditation -- regional accreditation -- primarily serves traditional colleges and universities, both public and private. Online programs at a school also benefit from this type of accreditation. Six regional accreditation agencies in the U.S. exist, representing the western, northwestern, southern, northeastern, midwestern, and New England regions of the country. Alternatively, national accreditation is typically reserved for technical, vocational, or for-profit institutions. Additionally, individual programs and departments at a school can receive specialized accreditation. Specialized accrediting agencies, such as the Accreditation Council for Pharmacy Education, focus on particular disciplines, extending accreditation to programs that adequately prepare students for work in a specific field. Accreditation for the best online programs in curriculum and instruction typically comes from the Council for the Accreditation of Educator Preparation (CAEP). With the goals of providing continuous improvement, quality assurance, credibility, equity, and strong foundations, CAEP uses evidence-based practices to ensure educator programs meet various academic standards. The agency also hosts CAEPCon -- an annual conference where attendees learn about changes in agency policy, standard revisions, and quality rubrics. Online doctorate in instruction and curriculum programs prepare students for careers in P-12 teaching, administration, and higher education. Graduates can find professional success as curriculum specialists, instructional coordinators, directors, and superintendents. Those interested in working directly with students should consider working as P-12 educators, while graduates who want to work with administrations to develop curricula may enjoy a superintendent or administrative position. Overall, students who enjoy working with others and taking on leadership responsibilities typically perform well in online doctorate in instruction and curriculum programs. Instructional Coordinator: Instructional coordinators develop curricula for schools and create teaching standards for educators. They work directly with teachers and administrators to develop course materials -- for both P-12 students and adult learners -- and analyze their effectiveness. Postsecondary Teacher: These educators work in colleges, universities, and other institutions of higher learning. They provide students with the necessary tools to understand their discipline and join the workforce. These educators also work in academia, publishing scholarly journal articles. High School Principal: This administrative position involves overseeing the everyday operations of a secondary school. These leaders participate in the school's day-to-day activities by coordinating curricula, working with teachers, and mentoring students. In short, they manage the school’s staff to ensure everything runs effectively. 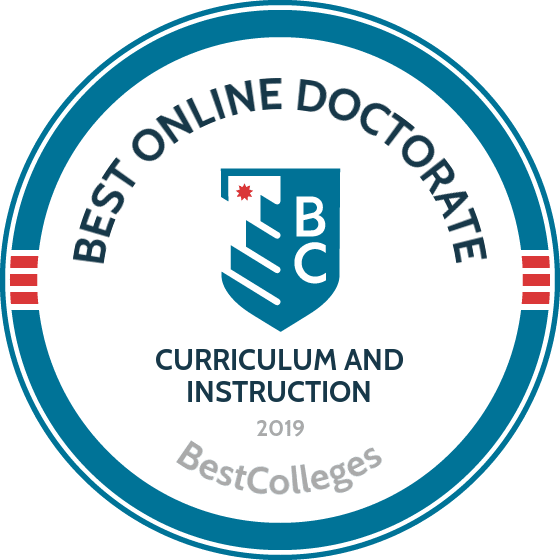 The best online doctorate in curriculum and instruction programs help students find positions as specialists and directors. These positions offer attractive salaries, and their demand continues to grow. Because a professional's salary usually depends on their experience, these workers tend to stay in their positions for extended periods of time, steadily increasing their earning potential, as shown in the table below. Professional organizations for curriculum and instruction educators and administrators connect graduates with like-minded individuals in their field. These organizations also provide networking opportunities for students to help them land jobs after graduation. Many maintain branches all over the country and feature alumni members from various universities. Graduates interested in developing their careers in the field of curriculum and instruction should look into the organizations mentioned below. Association for Supervision and Curriculum Development: This organization holds more than 100,000 members worldwide. The association endeavors to provide excellence in learning, teaching, and leading so that all children can remain healthy, safe, and engaged by their school work. American Association of School Administrators: AASA members work to positively influence public education and become leaders within the public school system. American Federation of Teachers: Boasting over 1 million members, AFT represents one of the largest professional organizations in the nation. Members include P-12 teachers, paraprofessionals, administrators, and other faculty. Students can utilize a number of resources to help pay for their degrees. For example, they can research local and national organizations to apply for scholarships. Some employers also provide financial assistance to employees who elect to go back to school; prospective students can contact their company’s human resources department to find out if such a program is available. Additionally, the U.S. Department of Education provides grants, scholarships, and loans to students who qualify for federal aid. Students should complete the Federal Application For Student Aid (FAFSA) form each year to find out if they qualify for federal assistance. As a last resort, learners can also take out loans from other public and private institutions. Approximately two-thirds of today’s college students rely on loans to fund their education, but plenty of overlooked financing options can reduce your overall student debt. Financial aid for online learning is equivalent to what you’ll find for campus-based learning, but that hasn’t always been the case. Learn about recent changes, along with the different funding opportunities available to online students. Online college programs make for flexible, affordables option for single parents who want to earn their degree and secure their family’s financial future. We’ve compiled a list of scholarships, grants, and other financial aid options geared toward single moms and dads. Millions of dollars in free money is available to U.S. military personnel, much of which goes unused. Learn more about grants, scholarships, and other financial aid opportunities available to veterans, active-duty service members, and reservists.